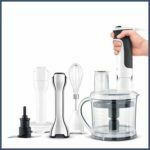 15 of the best hand blenders to buy now – 2019 update ! 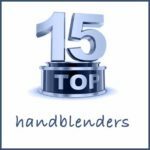 From the top 10 hand blenders in the UK in early 2018, this has now become a global top 15 hand blenders in 2019. It includes hand held food processors and not every winner is available in every country. So, if a winning hand blender was not as easily available in your area ( e.g. 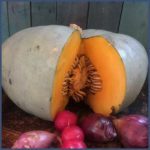 Breville is more common in Australia, Cuisinart in the U.S.) then we also investigated and provided a best (or even better) alternative for you so you also have your very own top hand held blender list to choose from too. It would be remiss to not refer to the household names behind these magical little machines. All this research also really led us to our top 10 globally awarded hand blender brands. KitchenAid, Cuisinart, Braun, Breville, Bamix, Waring, Kenwood, Russell Hobbs, Dualit, and Morphy Richards. There are many more of course, in the U.S. especially… so to our look out list for future awards, add Hamilton Beach, Oxa, and Oster and Chefman. In 2019, our newest favourite U.S. brand is N.Y. based Dash ! In the UK specifically…add in VonShef, Sage (because it’s Breville + Heston Blumenthal… what a combo ! ), and our newest U.K based brand we like is Andrew James. Researching the hand blender product lines. Some brands are only dedicated to hand blenders, some only to kitchen appliances, and some have a varied household appliance set of product lines. Having researched these for over a year now, we really get a feeling for these amazing little kitchen appliances, and the thought that the manufacturer has put into developing each one. We can see how they have been developed over time and how they fit in their own product lines. We keep updating information for you as we live and breathe this subject every day. We also assessed how the information was communicated on the internet, so our own opinions on this are embedded into this list too! 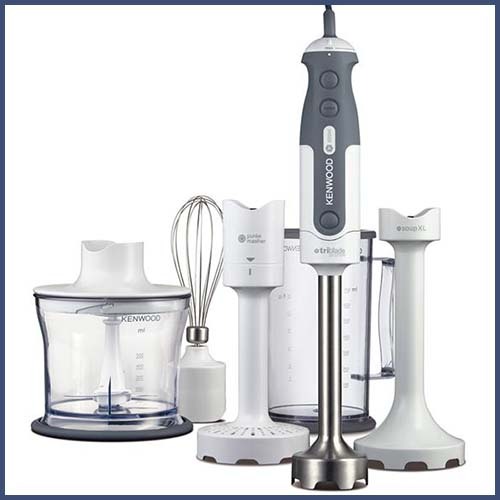 We started our hand blender reviews in 2018, and mainly with hand blender reviews in the UK. First of all we reviewed the reviewers, and the sellers, some of the manufacturers, and the users reviews online. We researched every article we could find online from the last three years, over and over and over. 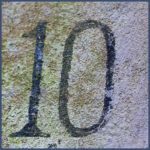 We have looked in depth at those with the most accolades, mentions, or awards in 2018 in particular. This became our daily living, and a passion to get to the bottom of this subject! We then wrote our own detailed buying guide and then went back and made sure we checked all the award winner against these criteria too. We talked to everyone we could about hand blenders and used our own hands on experience with several models… (we found that we had many connections with people using the winning brands so we got direct user information in particular… on Breville / Sage, Bamix, many Braun hand blenders, Kitchenaid, Kenwood, Russell Hobbs and more). All these experiences were from users all the way from start-up cook to chef, from shops that sell hand blenders, manufacturer’s own technical or sales support teams and sales desks by phone. We looked at all the customer forums, reviews and post-sale customer comments we could find. We interacted with users online, and talked directly with manufacturers to get down to the nitty gritty details. We read the press articles on the most loved models and brands. It took months to digest and decipher the facts, then the story started to form… and it continues as we now have these contacts and update all the time. We hope you too will comment and discuss with us s that we keep these reviews up to date for everyone. You’ll see as you read on, which one we bought as a result ! We were tempted by so many of them and still thinking of who we can give as a gift. Of course, what suits our needs right now, may not be your choice, for good reason. 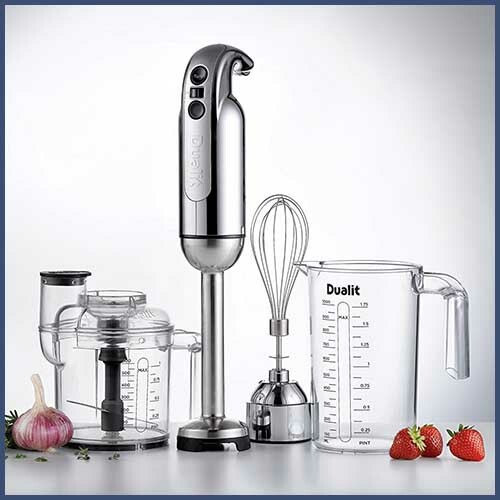 We do hope you find the right hand blender for you in the list below. 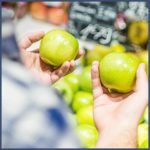 You can read more about how to choose the best one for your own needs in our detailed buying guide. Click on the links below to take you to related in depth reviews, and use the Amazon buttons to check out the current details and prices in your own country. If anything doesn’t work as you would like, or needs fixing, please pop some feedback in the comment box and we will get on to it right away. Our final choice…. And our best back to basics blender winner in 2018. This is cheap & cheerful, but pretty stylish. It comes in a simple glossy white finish. The Russell Hobbs 22241 (on Amazon) has a plastic leg / arm / shaft and a stainless steel blade. Powered with a 200 watt motor, and two speeds. Weighs 1.7 lb / 0.78Kg, and the power quality is reflected in the price. We think you’d pay the same for one great drink in a high end cocktail bar, but just think how many cocktails you could make yourself with this nifty little tool. It does only one thing, and you can’t add more attachments, but what should we expect at that simple introductory price ! We have done an in depth review of the Russell Hobbs 22241 here. Up to 3 yr guarantee. Great for everyone to have in the kitchen drawer as a back-up, or the present drawer as a gift ! One stick easy to use and store for students, young mums making baby food, and seniors. Some people don’t like that you have to keep your finger on the button to keep it on. Looking at all the reviews, the sales blurb can also say it comes with a 0.5L jug included… but the jug doesn’t always seem to be arrive ! See Russell Hobbs 22241 Customer Reviews on Amazon in your country. 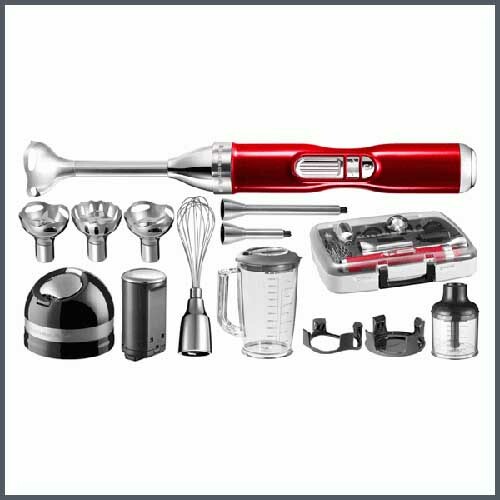 KitchenAid make an electric 2 speed, 3 speed and 5 speed, the cordless 5 speed blender, and a high end range of professional commercial models. This 3 speed one, on Amazon, seems to get its awards in the U.S. , and isn’t always as easy to get in the UK or Australia, so click through below and if it’s available – grab one! It comes in contour silver, onyx black, or white. Its relatively light, with a soft grip handle and is aimed at providing a quality product for a relative bargain compared to the higher echelon models. 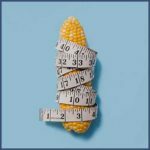 Some users have said it can be tricky to remove food. See Kitchenaid 3 Speed Customer Reviews on Amazon in your country. 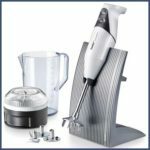 KitchenAid 2019 entry level hand blender available in the U.K. The entry level KitchenAid models are not as easy to find in the U.K. and usually only in white or black, but it’s lovely to see this pale pink one here. (In the U.S. it comes in 18 colours!) Click on the picture above to check it out on Amazon. The classic 2 speed model is a good, solid option with an 8″ blending arm with fixed blade, which just twists off for quick and easy cleanup. Size is 2.5 x 2.5 x 16″, so just a tad fatter and longer than the 3 speed one. It’s not the lightest choice at 1.78 kg and not a budget model. However you are paying for the quality and design, and possibly also for it being unusual to have outside the U.S. in other colours. Comes with a 700ml BPA free graduated blending jar (jug) and lid. Grab it in pretty pale pink while you can ! 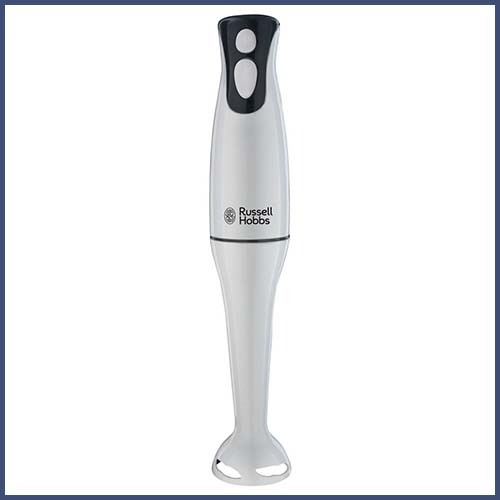 This lightweight specialist hand blender gets straight to the point. It gets our vote for being a unique, simple straight to the point product that seems to do the job brilliantly by all accounts. It has two specialist blades, a masher and an aerator. 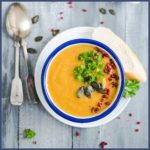 The Masha Dash is on Amazon, and covers the whole range of simple every day foods for the whole family – from purées, soups, sauces, baby food, cakes and desserts. fast – most people say it just takes seconds to make perfect mashed potatoes. The manufacturer says 10 seconds. See Dash Masha Customer Reviews on Amazon in your country. The most popular model from the Cuisinart Smart Stick range. It won 5 times in 2017 Internet awards but here’s the thing…you will find many conflicting reports of this Smart Stick Immersion blender… saying it’s no longer made, its successor then being the model 76 with 17 colours! The letters after the model number relate to the colour of blender by the way. Personally, we think the many colour-ways are why this model seemed to be more popular than the upgraded sister product CSB-79, which, by the way is only available in brushed stainless steel. We have now re-written this review so many times because there is sooo much inaccurate information on the internet! So, we see our main job here is to simplify what’s available for you to buy! It looks like the hand blenders model numbers used to be the CSB- 33BC, 44N, 55N, 75, 76, 77, 78, 80 although you will see remaining stock for sale. The new ones are 11 products in the U.S. the following model numbers (from lowest to highest price and spec.) CSB-33; 75 (75BC / 75R / 175 / 175R); 79 (179); 750H; 100; 300. Thanks Cuisinart… much simpler! They are all slightly different shapes and finish, and the CSB-75 has a lovely slender profile that reaches deep. The latest model of the CSB-75 (on Amazon) is still the only one that comes with colour choices, but this time it’s just white, red, metallic red, brushed chrome, and my favourite … the pink blender. Beautiful. If you see a different colour then lucky you…we’ve seen a gorgeous metallic charcoal, raspberry red, and silver – perhaps these are still left from old stock! Finally, look out for a new 3 in 1 cordless model introduced in the UK – see our article on cordless hand blenders for the details. Powered by a 200watt motor with two speed settings… low and high. Being an American brand, like KitchenAid, everything is described in cups and pounds (LBs). So here’s the low-down for everyone. 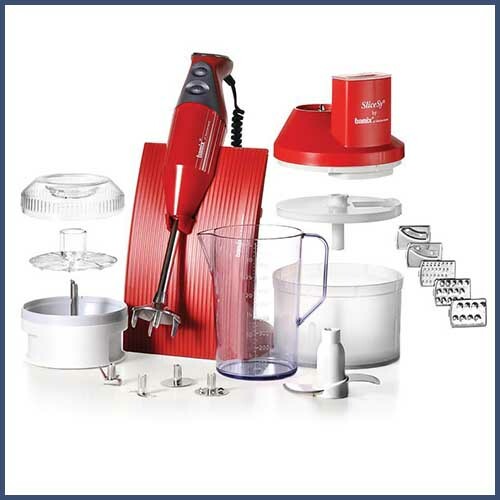 It has a 2.5cup (0.6L) chopper with lid, a 3 cup (0.7L) beaker with lid, a handy washable storage bag, and a 5 ft power cord and weighs 2.2lb (1kg), and comes with a 16oz (0.5L) mixing / measuring jug. We would advise checking carefully what you are getting when you buy one, since there have been so many variations and old models online. Whatever you get, I’m sure you will love it. It seems to have been Nigella’s favourite brand for a long time! The 3 year warranty. (most other hand blenders come with 1 year). The muddle of model names all over the internet… make sure you get the newest version. It has a lock/unlock feature which some people don’t like having to use. The longevity and overheating might be an issue but there are so many comments based on the old models so let´s give the latest model a chance! Not always easy to find, or even available. This is usually the case if they want to offer something better! For example, check out the 300Watt CSB-76 model in Australia ! See Cuisinart CSB 75 Customer Reviews on Amazon in your country. 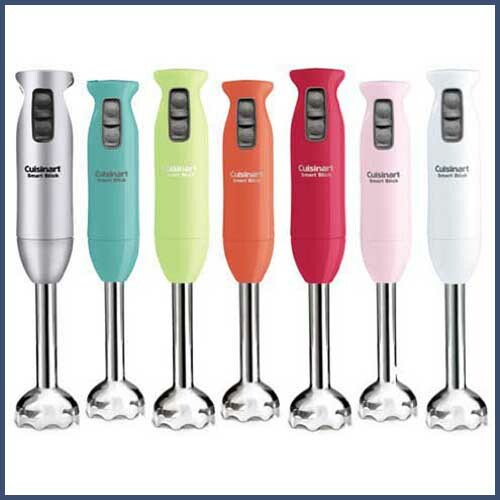 This one gets our vote for the best all round home kitchen hand blender set. Its designed to be a simple and comfortable experience with five attachments. The price point is great and you get an awful lot for your money so you best get cooking! The HDP406 (on Amazon) is made in the UK, and comes simply in white with some soft grip grey areas on the body part. It gets its power from an 800w motor and 8 speeds. 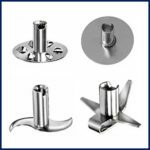 The stainless steel blade is a patented tri-blade (all in one foot if you like!) that has 3 angled blades and six blending ribs. The idea is that all this complication disrupts the flow of the food, so you get a high performing hand blender with the one tri-blade. As well as a balloon whisk you might expect, it comes with some extra specialist shafts, an XL soup blender and even a potato / vegetable masher attachment. It also comes with a 0.75L jug and a 0.5L chopper bowl. Both have measurement markings on the side. By all accounts this set seems to be very versatile, powerful, easy to clean and great value! All the attachments pop off by squeezing two buttons at the bottom of the body. We’re being picky here but the 750ml beaker has a lovely grippy base and lid but annoyingly no spout. It would be nice to have a loop at the top for hanging it up. See Kenwood HDP406 Customer Reviews on Amazon in your country. We have done an in depth review of the Kenwood HDP406 here. note it can be called the HDP406 or HDP406WH which we assume stands for ‘white’ version. It doesn’t exist in any other colours though! For a gorgeous cream or red or black metallic upgrade, in the UK have a look at the Triblade sister model, the KMix. (in Australia look here). Same functions but looks fabulous! This is a really well priced all in one set. 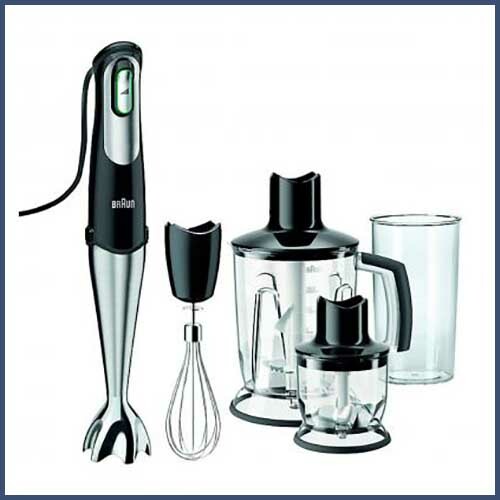 It comes with a Stainless steel blending leg, 2 gearboxes, whisk, chopping bowl, potato masher, and 750ml jug. The Morphy Richards 203052 (click on the link to see it on Amazon) weighs in at 1.7Kg and has a 650Watt motor, with eight speeds. By all reports, it is just powerful enough, but at the price it makes a great job of being all things to all people. A trigger button allows the speed to build up gradually (thanks to its Smart Response Technology, and also makes the speed slow down slowly as you take your finger off the control button (..not sure if we would prefer it to just stop straight away!) The attachments can be clicked on easily with a button at the back. It has some nice features like the nice heel rest at the back, and a soft-grip silicon handle. It could be more powerful but for the price it’s great. A little old fashioned style -wise ( in our view only ). See Morphy Richards 402052 Customer Reviews on Amazon in your country. The Dualit Porfessional DHB2 (see more info on Amazon) is a unique looking blender that won a record 5 times in 2017 Internet awards. 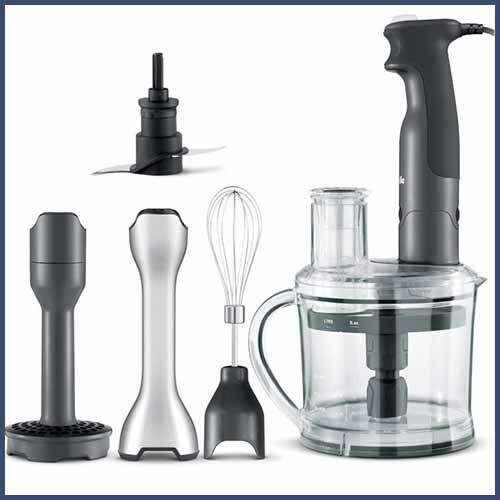 A great value immersion blender with lots of accessories… a chopping bowl pot (0.6L) with feeding tube lid, measuring jug (1Litre) with non-drip spout, whisk accessory and the stem blender itself is designed with a nice control grip. It has a 700W motor (in the UK version) with two speed settings of 7000-16000rpm, and turbo up to 18000rpm. By the way Dualit started in Germany in 1945 and they call the shaft / leg / arm thingy a ‘wand’. It is quite unusual in design and has a 6 prong blade and patented anti suction vortex technology to avoid any pan scratching, and very distinctive polished silver / chrome look. Its parts are repairable and replaceable and are BPA free and dishwasher safe. It comes with extra motors for the whisk and chopper attachments, and these motors can’t go in the dishwasher of course. The chopper bowl has a nice feature of a feed tube also. All in all they have tried to think of every great feature you would wish for in this all in one set. the ergonomic design that allows it to sit nicely on the puffy part of your hand between thumb and first finger… like an extension of your hand while blending. Nice if you are left or right handed ! The non-slip feet on the chopping bowl. The chrome finish is actually a high-end plastic that mimics the look of chrome, and it can mark and tarnish a bit too easily. See Dualit DHB2 Customer Reviews on Amazon in your country. A very versatile brand…getting five different awards world-wide, but for different models… interesting. Does that mean they are all pretty good, and which one is the current star ! 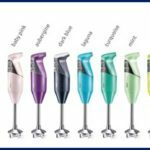 This started a research project of its own, and on one online buying site alone, we found no less than 47 different Braun hand blender options!!! So perhaps getting 5 awards spread across these was an even bigger achievement. Well deserved Braun. It now looks like they have tried to simplify the branding. Every current model is now branded as multi-quick… and with a number for the series 9, 7,5,3, or 1 or a market driven name (e.g. the MultiQuick 5 Baby). Just remember, in general, the higher the number on the model, the better the blender and more complicated and expensive the product. Here, we love that Braun have thought of ice crushing as its something we love to do for our Expresso Martini aperitif! So we love too that they call this model the MQ745 Aperitif ! It boasts a 750W motor and a smart speed technology that allows you to just squeeze the button for more power. 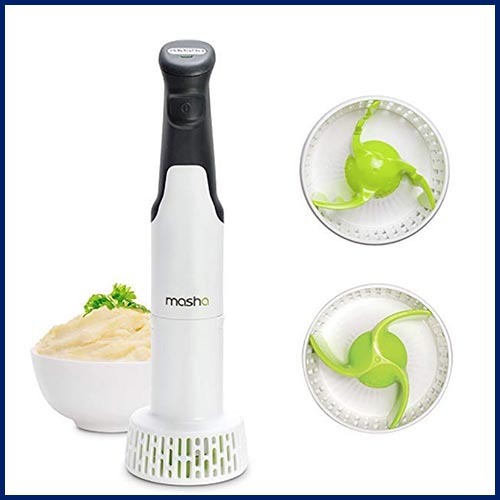 It has 5 extra attachments: a 1.25L chopper / blender / ice crusher, a smaller 350ml chopper for herbs, onions etc. whisk accessory, and a 600ml beaker. We debated for a while which Braun was the one to win a place in this category – multiquick 5 or multiquick 7 series. The MQ5 is seriously popular particularly for its MQ 523 baby model, but this MQ 745 , on Amazon, model got our vote because of the extra special 2 in 1 chopper blender jug, with its ice crushing blade ! Braun still tend to confuse us though with their ranges and model numbers in different parts of the world. If you want this ice crushing tool it’s called the MQ40, and some have said to us that it’s available also in the MQ9 series, but on further persistent questioning to senior customer support in the UK, they confirm it’s only compatible with the MultiQuick 3, MultiQuick5, MultiQuick 7 series” (thanks Tululah). In the U.S. online support however, they just announced to us ( we took a screenshot this time just to convince ourselves – thanks Rafael:) that it is now available as an accessory on the MQ 9 series in the U.S. That makes sense, as the U.S. region also offering it as part of a set – the MQ9097, a set which is not available in the U.K. The MQ745 (on Amazon) is the model number in the UK for this set. If you want this ice crusher in the U.S. you can get it with the MQ757, the MQ9045x or the MQ545. If you want it in Australia, you can get it with the MQ3045. 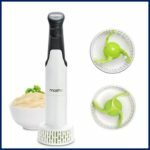 Safety button, powerful fast chopper and whisk. Aoibheann has been using a Braun almost every day for the last few years winter months (our landlord kindly left one for us!) and she loves the easy click detach system for the accessories. You get the advantage of having both a large chopper and a small one, so you do get to be able to chop large and small amounts really well. Something other models can’t boast. Ok its looking at our 3rd Pro from another angle, because we still feel a little uneasy that you have to have a separate vessel to do the ice crushing. It starts to make the hand blender set quite big. See Braun Multiquick 7 Customer Reviews on Amazon in your country. The Control Grip All in one Hand Blender by Sage, is essentially the same as the BSB 530XL is the U.S. and the BSB530BSS in the Australia. It was one of our top 3 picks as the best foodie hand blender set 2018. Built with high quality material leading to great durability. Both the blending shaft and the ice-crushing blades are made of stainless steel. The motor is a powerful 700Watts, and it has no less than 15 speeds! The Sage Control Grip (on Amazon) has a nice pistol-type hand grip quite like those on commercial grade blenders, and a trigger variable speed control that makes it very comfortable and easy to use. Apparently it chops ice , always something we look for ! 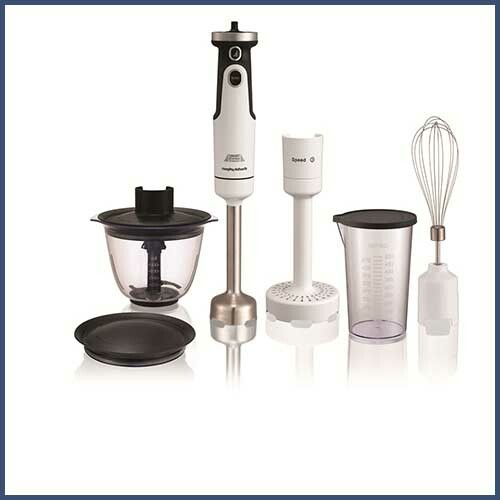 The Control Grip All in One Hand Blender by ‘SAGE by Heston Blumenthal ‘ is made for the UK market. So don’t go looking for it in Australia and U.S. – at least not by that name. See Sage Control Grip Customer Reviews on Amazon in your country. Breville is easily available in the U.S. and Australia, but they seem to making their way across Europe under the SAGE banner ( Italy and Spain coming soon they say). So the Breville BSB530XL All In One Processing Station in the U.S. is the equivalent machine! In Australia, the equivalent model that you need to get is called the “BSB530BSS All in one Stick Mixer”. Click on the Australian Amazon link before to check it out and see that it’s the same machine! 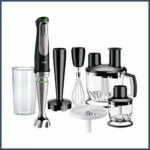 Breville have been awarded four times online in the last few years for their hand blender set, probably because its built with high quality material leading to great durability. They only offer two sets, the Control Grip , and the All In One. The Control Grip is also known as the BSB 510 model. It has stainless steel blades, power is 280 watts (in the U.S.) and it has 15 adjustable speed settings too. Check it out on Amazon U.S. here. On the BSB 510 model, the shaft is a standard 8 inch (just over 20cm) length with stainless steel blender foot, a wire whisk attachment, a 42oz / 1.25litre mixing jug, and chopper attachment (0.75L) with lid that stores inside the jug! It also promotes its own unique anti-suction technology and bell shaped chopper end, resulting in less liquid spilling out of your bowl. In fact, we’d say the Control Grip model is like the Braun MQ745 (see on Amazon) above, and the All in One is like the Braun MQ9087x (see on Amazon) below. One difference though, the All in One can blending leg can crush ice ! Bamix Superbox, the smallest hand held food processor in the world. As well as inventing the first hand blender in the word, this Bamix set is the world’s smallest hand held food processor. The Bamix Superbox is essentially the 200Watt SwissLine or Colorline model, PLUS all the extras. The shaft is the Bamix standard shaft length (5.375 inch which just over 13.65cm). p.s. yes it can crush ice with the multipurpose blade ! It’s the same set the world over, unlike Breville that is also Sage, or Braun that has different model names and offerings depending on which country you are in ! It’s basically all of the components that make up the Bamix range, so if you get them all at once here, you save money ! The blades are so tiny and yet so powerful ! You can directly blend into hot soup on the hob, or into a crystal glass ! It’s quite light , at only 0.94Kg the Bamix immersion blender is really light and easy to use compared to most others. See Bamix Superbox Customer Reviews on Amazon in your country. 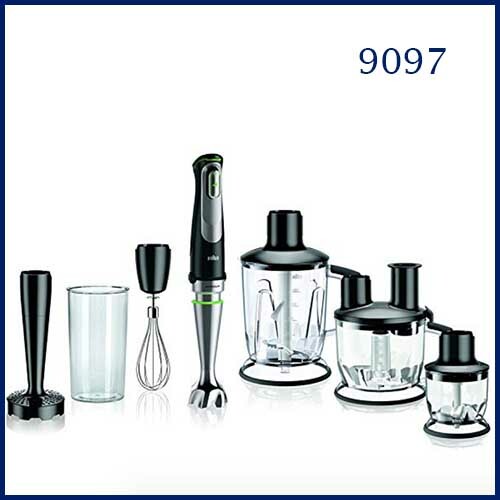 Braun MultiQuick 9 Hand blender MQ 9097 only available in Canada and the U.S. Elsewhere, the MQ9087x is the very next best thing (without the ice crushing jug). In fact, it’s even more popular as not everyone wants another jug and ice crushing feature. It’s taken a while to get to grips with this latest MQ9 series and particularly the 9087x model (on Amazon). We were led to believe initially that the MQ 40 ice crushing jug could be added to the MQ9087x series to give the equivalent complete set as the U.S. 9097 version … but no! The latest conversations with Braun in the UK have confirmed that this is not possible. So well done U.S. Braun! You have our vote for the ultimate Braun set that not only makes the tougher jobs ( e.g. meat mincing and fibrous fruit and veg.) easier, but also gives us a counter top ice blender jug too. The model that is more commonly available worldwide is the Braun MQ 9087 (See it on Amazon). See our in depth review here. Safety button, cool black design and very powerful 1000Watts. We’ve even seen this model sold in chef / professional kitchen supply shops. New to this series is the unique ACTIVEblade technology where the blade moves up and down to make lighter work of the toughest jobs. What more could you ask for . The processor even comes with a french fry cutter! Great having a large 1.25L jug, but you have to remember not to fill it up because you can’t blend large quantities of hard ingredients in it. For example, no more than 7 large ice cubes. It’s a rather huge setup now isn’t it for what started out as a nifty hand blender. So it will take up some counter top or cupboard space. You had better be sure you either need all these accessories, or have the space for them. See Braun Multiquick 9 Customer Reviews on Amazon in your country. KitchenAid blenders got 5 awards online in 2017 … three for this cordless model. This cordless blender is the first one we want to tell you about because it’s both pro- grade, and also a very desirable kitchen (or even travel) accessory! Cuisinart CSB-300 ( with electric knife attachment! ) is probably the closest competitor to this, but it’s not a brand that you see a lot in the UK. 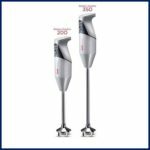 Click over to our post on cordless hand blenders for more detail on the KitchenAid and it’s competitors – we are updating all the time. The KitchenAid Cordless model is on Amazon, and is part of their Professional grade series (Pro Line) and usually comes in a neat plastic case to put everything away together. The cordless comes in the UK in an Empire red accent colour – we’ve loved having that for years in our own kitchen in the U.K. In the U.S. it comes in three colours ( onyx black , sugar pearl and candy red) . It has a 12V rechargeable lithium-Ion battery and charger, five speeds DC motor with an LED indicator, two shafts / arms (20 and 33cm) and five accessories. Three interchangeable bell ends (with guards) to chop, puree, and froth. A removable pan guard, a 1L jug, and a Chopper bowl with non-slip base. It has the same functions as the corded electric 5 series (on Amazon) – both have a maximum speed of 11,000rpm . Most of all… no annoying lead ! Heavier due to the battery, and maybe also heavy in the pricing! You get pretty much all the same functions in the equivalent 5 speed electric model (see it on Amazon) but its going up toward twice the price to have the sleek stick and no cord. See Kitchenaid Cordless Customer Reviews on Amazon in your country. The most popular KitchenAid in UK and Europe seems to be the 5 speed version, in red or black, with or without the cord. We feel the KitchenAid 5 speed hand blender is the best option for the pretty serious ( and stylish ) cook. It´s made of more heavy-duty metal than some if its competitors. 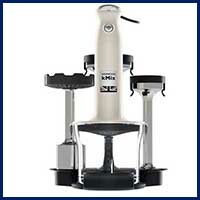 The body comes in silver, black, red, or white, and attaches to a stainless steel a removable twist and lock blending arm. It usually comes with 3 blades and 2 arm lengths (20cm and 33cm). So, you can crush ice, chop meat, blend soups and use the long arm for big pots and deep jugs. 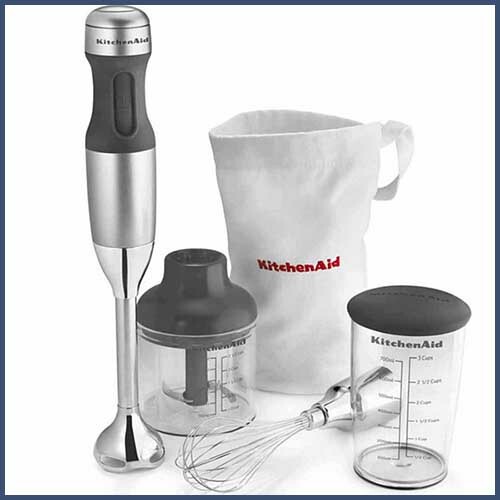 The KitchenAid 2571 5-speed model (on Amazon), just like its cordless equivalent, comes in a storage case with pan guard, blade protectors, whisk, chopper, and 1 L jug. ( Note: this is the same as the 2561 model in the U.S. ) These attachments are dishwasher safe for quick clean up. Just incase you get confused ( we’ve been there!) you will see that this is similar looking, but more expensive, than the gorgeous 2570 limited edition Queen of Hearts bright red model (which has no case, no chopper bowl etc). Online it looks like the Waring Immmersion blender got more awards than any other commercial grade hand blender. This is the big competitor to Bamix. Waring Commmercial is a US manufacturer with 75 years of experience. It’s a brand well known for introducing the first big blender in America. The Waring Big Stik range has several compatible shafts… the winner of most awards is the heavy duty model with the extra long 300mm shaft! Being commercial, the heavy version can be a bit … heavy! However, it can work on up to 40 Litre capacity and also has a continuous feature allowing you it to operate hands-free and non-stop! If you don’t need that much, they have another range (the Quick Stik – on Amazon), the best is the medium version with a 650W motor that also produces up to 18,000 rpms. They both boast an all purpose stainless steel blade and shaft that does any task from light whipping to pureeing and emulsifying. The medium is 10” (254mm) with 650 Watts power and a two speed control. 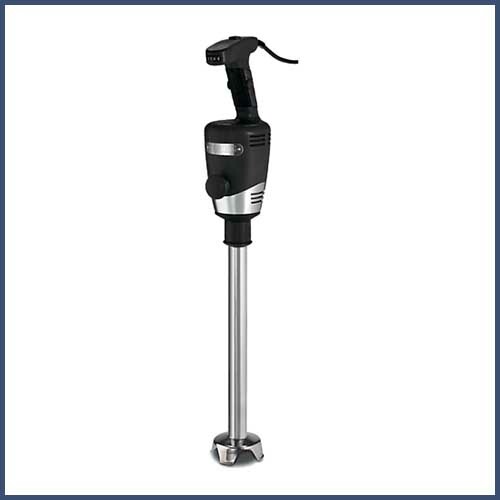 The heavy duty is the 12” (300mm) shaft, 750 W, and has a variable speed control up to 18,000rpm. It can handle up to 10 gallons so a pretty serious piece of kit! The shaft is easily removable and dishwasher safe. They have a rubberised ergonomic comfort handle and a second handle for safe and controlled operation. The completely sealed, easily removable handle is also dishwasher safe. For busy cooks or chefs it has a ‘continuous on’ feature so you can even do hands free blending, whilst you get on other kitchen tasks! They come with a 1 year warranty. 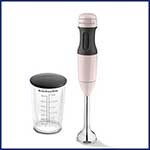 The light version is priced similarly to those in the mid range hand blender section above. The leave on feature to let it sit in the pan on its own and do the work for you ! You do need that extra handle when it comes to the heavy duty model… which comes in at a hefty 21.3 lbs..about 9.5 kg ! See Waring Quik Stik Customer Reviews on Amazon in your country. A Bamix standard length model, wall bracket, and all four tiny powerful blades. Maybe we’re biased but whilst we didn’t see any awards up to 2018, we couldn’t ignore the many comments all over the internet between chefs and semi-pros on the reliability factor, saying it is fairly priced, and would likely outlive most other hand blenders. Now, since we have listed and loved this brand, it seems to be getting more press on other review sites too. The Bamix hand blenders are totally Swiss made, and have a simple professional steely look. In fact we wrote about the whole Bamix product range recently, to explain why we love it so much! We have voted this as our Best Commercial Blender on our hand blenders main page. We can’t help choosing the Bamix gastro range as the purist’s choice and have written a great in-depth review of the Bamix gastro 350 separately. However for a more complete set for the serious cook or chef at home, for around the same price, we also chose the Bamix SwissLine 200Watts (M200) model. We love it so much we bought one ourselves, and have devoted a separate blog to it, just click on the previous red Bamix Swissline text. We choose 200W minimum for the Bamix, but this 200W is not comparable with other brands. Its not about the watts when it comes to a Bamix. The quality of the powerful 200W precision balanced motor keeps a constant, precise speed under heavy loads. It also reduces vibration to ensure quiet operation and optimum power at all times, so this also make its extremely energy efficient! It appears to be very light at 2.4lbs, and simply comes with 2 speeds and 3 stainless steel blades that are easy to change: the chopper, aerator, and blender all do their work efficiently in seconds!The body housing made of PA6 safety rated nylon is odor resistant, grease repellent and and fully sealed. The 11.4inch shaft is made of chromated brass which makes it strong, durable and heat resistant. 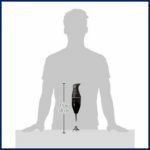 The shaft does not detach from the body but it’s easy to clean under running water. The Bamix Swissline (see more info on Amazon) has every accessory or attachment you need to turn it into the world’s smallest most powerful hand held food processor. See our separate blog article with details on all the attachments. The extra long shaft on the gastro range. All Bamix body housings are fully sealed so are high heat resistant and can be totally immersed even in boiling liquids. This makes the submersible length a whopping 15.4 inches! The small size and light weight in general, and the sheer power in your hands. The user manual doesn’t say a lot ( in many languages!) . To be fair there isn’t a lot to say, its so neat, simple and intuitive to use. Some people find it a little tricky taking the blades on and off. Just be aware that as you go from the Swissline to the gastro 200 to the gastro 350, (all are available on Amazon), the stick gets a little heavier each time. ( from about 0.95kg to 1.25kg ) Still nowhere near the weight of the equivalent KitchenAid though ! See Bamix Swissline Customer Reviews on Amazon in your country.